Long-running BBC TV music show Top of the Pops has been broadcast for the last time in its 42-year history. The one-hour finale, shown on BBC Two on Sunday, looked back over the show's four decades and featured a number of memorable archive clips. 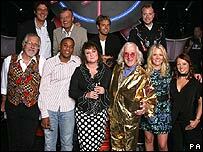 Many of the show's former presenters returned, including Sir Jimmy Savile, Dave Lee Travis and Mike Read. The final word went to Sir Jimmy, who signed off with: "It's number one, it's still Top of the Pops." After the credits, the veteran broadcaster was seen turning out the lights at BBC TV Centre's Studio 3. The BBC decided to axe the weekly show last month, saying it could no longer compete with digital 24-hour music channels. Sir Jimmy opened the show, just as he did when the first one was broadcast in 1964. 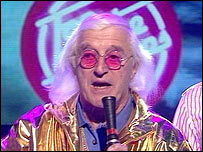 On this occasion he was wearing a shiny gold tracksuit. He was surrounded by fellow presenters from down the years, including Janice Long, Reggie Yates, Edith Bowman, Pat Sharp, Sarah Cawood, Rufus Hound and Tony Blackburn. "Forty-two years ago I said welcome on the very first Top of the Pops," said Sir Jimmy. "But it belongs to the world now. They are going to carry the Top of the Pops banner." The first classic performance came from the Rolling Stones, who were shown singing their hit The Last Time in a black and white clip from 1965. The band were the first to appear on the first programme. According to Sir Jimmy, however, the tape of them singing I Wanna Be Your Man had been lost by the BBC. The next classic moment featured the Spice Girls' Top of the Pops debut in 1996 with Wannabe, taking the audience back to the heady days of 'Girl Power'. There followed footage of a young and colourfully dressed Michael Jackson, singing Rockin' Robin along with his brothers in a clip from 1972. Robbie Williams in the early days of his post-Take That career followed with Let Me Entertain You from 1998. Pat Sharp described Williams as "testosterone on legs", while presenter Edith Bowman said he had appeared on Top of the Pops more than 100 times. Other artists featured included David Bowie singing Starman from 1972, Madonna in a shocking pink wig performing Like A Virgin, Wham from 1984 with Wake Me Up Before You Go Go, and Gnarls Barkley with this year's smash hit Crazy. Almost 200 people were in the audience for the show, which was recorded last week. "Don't the audience look fantastic and so do we," said Tony Blackburn, referring to the way many of the audience had dressed as their favourite pop stars for the occasion. The presenters on stage also got into the party mood, cracking jokes at each others' expense and harking back to the days when presenters seemed to revel in hosting the show. The studio was decorated with many nostalgic elements from the programme's past, such as a huge glitter ball and dry ice. Many of the Top of the Pops logos from across the decades had also been brought back. As well as the individual archive band footage, the show featured montage films capturing the best of the pop decades from the 1960s onwards. One of these came from the 1970s, the era of flamboyant glam rock and the time when Top of the Pops is considered to have been at the height of its powers. 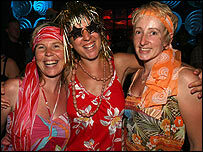 "In the 70s, Top of the Pops glittered," said Sharp. "The show was in colour and the clothes were even more colourful." The likes of Slade, Marc Bolan, Abba, Queen, Rod Stewart and the Three Degrees flashed across the screen, all sporting the compulsory long hair and, in Elton John's case, his trademark oversized glasses. The music ended with a video of Shakira and Wyclef Jean performing this week's number one song, Hips Don't Lie.